Having a healthy lifestyle is not an option anymore, it is mandatory. Luckily Social Diary is here to motivate you with fitness routine of your favourite celebrities! 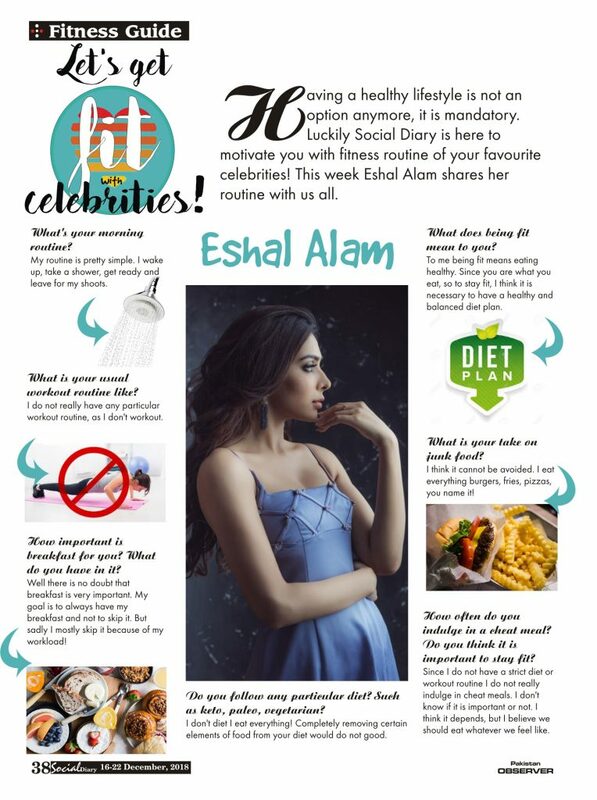 This week Eshal Alam shares her routine with us all. I do not really have any particular workout routine, as I don’t workout. Well there is no doubt that breakfast is very important. My goal is to always have my breakfast and not to skip it. But sadly I mostly I skip it because of my workload! To me being fit means eating healthy. Since you are what you eat, so to stay fit, I think it is necessary to have a healthy and balanced diet plan. I think it cannot be avoided. I eat everything burgers, fries, pizzas, you name it! I don’t diet I eat everything! Completely removing certain elements of food from your diet would do not good. Previous PostRevealed Next PostOrange Dishes!